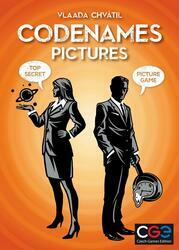 Let yourself be tempted by the images version of Codenames. To play, guess or guess more zany images than others. More accessible than the classic version, Codenames Images keeps the same depth of play while being more visual. You and your rival know the 20 cards to guess. Will your team manage to understand you to find them? Give one and only one hint, which can be related to several cards on the table. Your team tries to guess them with your index, while avoiding those belonging to the other team. And most importantly, do not guess the murderer, or you will lose the game immediately!